Finding speed loaders for a revolver is usually a simple task, considering the number of manufacturers and available products. 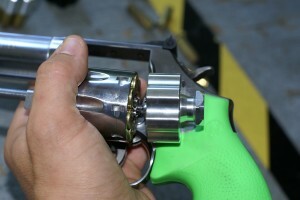 However, if you have a cylinder capacity larger than six rounds, your options become limited. 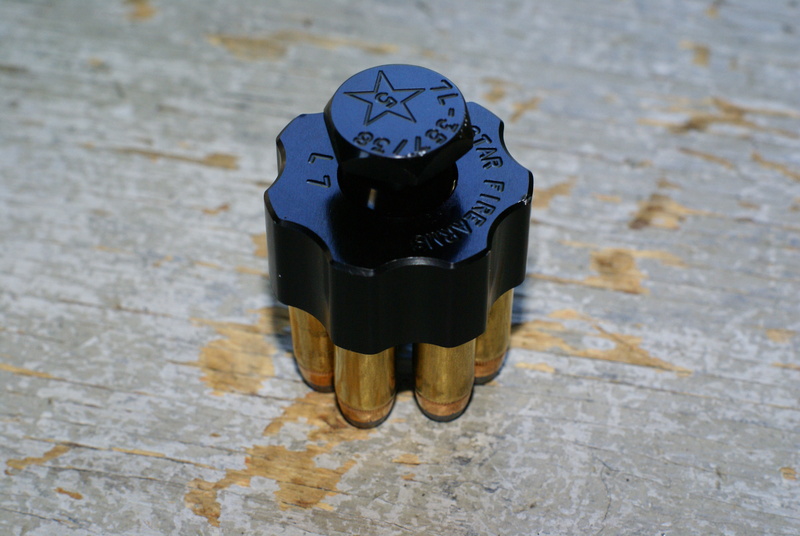 I was able to find commercially available speed loaders with a seven round capacity, but they were lacking in quality and reliability as the rounds would stay in after being released, or not fully eject resulting in dropped rounds during a reload. So now what? I cringed at the thought of spending money on more of them (regardless of manufacturer), and thought that my only option would be another product like a speed strip. So what changed my mind? 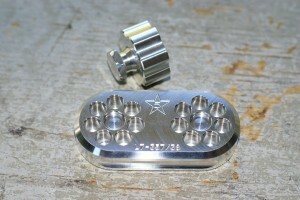 The products that 5 Star Firearms manufactures are the best I’ve seen to date, as you will see as you read this article. 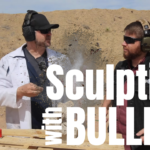 The products tested included (for seven rounds of .38/.357 mag. ); three speed loaders, a range/competition block, and a bedside block. 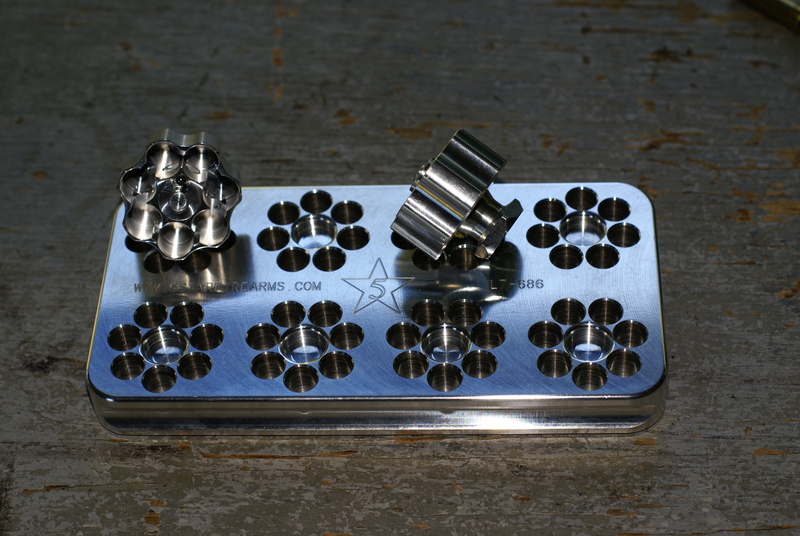 The products are made from 6061 billet aircraft aluminum, and have fair prices at; $69.00 for the range/competition block that includes two speed loaders, $32.50 for the bedside block with one speed loader, and $24.95 for a single speed loader. The fit and finish are excellent, and one of the tested speed loaders has a black anodized finish that is extremely durable. 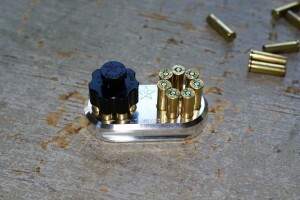 The range block provides the storage for eight reloads and has a clearance of about 3/8″ between the top of the block and the bottom of the speed loader, with about 1/2″ of the .357 mag. rounds securely in the block. The bedside block sits slightly deeper by 1/16″, and provides space for two reloads. 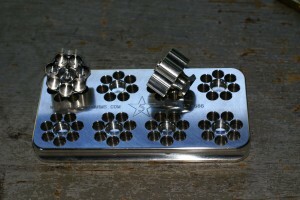 Both blocks have the 5 Star Firearms logo, website, model number, and “made in U.S.A.” machined in to them. 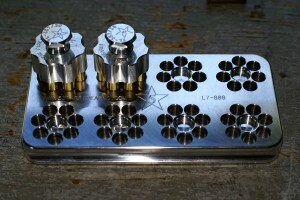 Both blocks are also drilled and tapped for mounting to a surface such as a night stand or table. 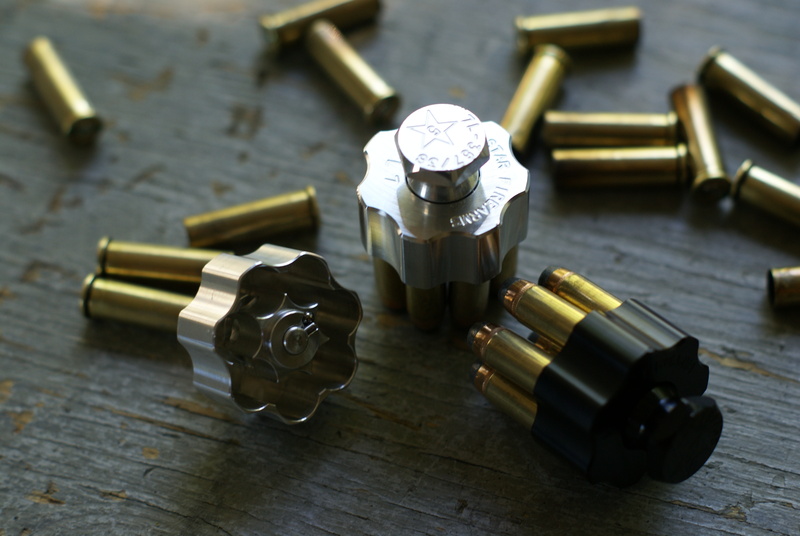 The speed loaders provide a positive lock on the rounds, and release clean every time. I tested them for two hours and never had a round stick in the speed loaders or not insert fully into the cylinder, even at a 45 degree (and lower) angle. I noticed a major difference in quality, ergonomics, and function/reliability between 5 Star’s and other commercially available brand’s products. 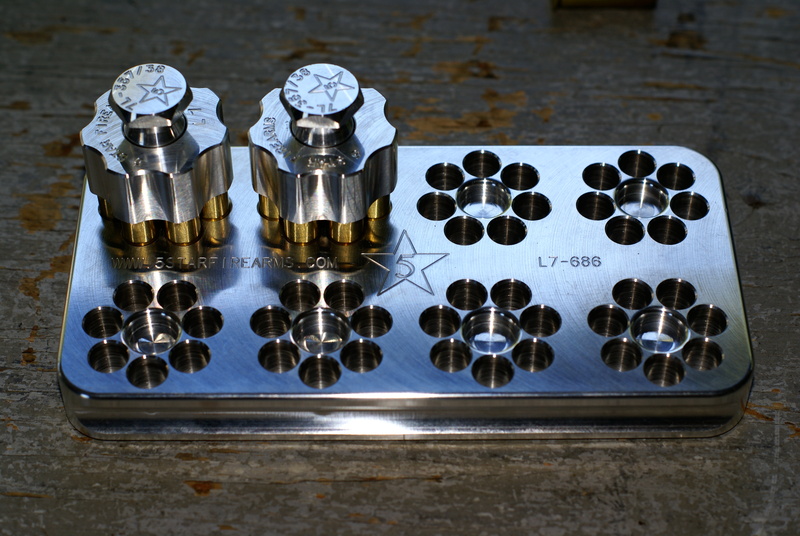 All of the lines, reliefs, and engraving are high quality (just like the blocks), and the speed loaders are available in a variety of calibers and finishes. The range block comes with two speed loaders, and lists for $69. The bedside block comes with one speed loader, and is available for $32.50. You can see why the range block is a perfect item to have down range, or for competition shooting. 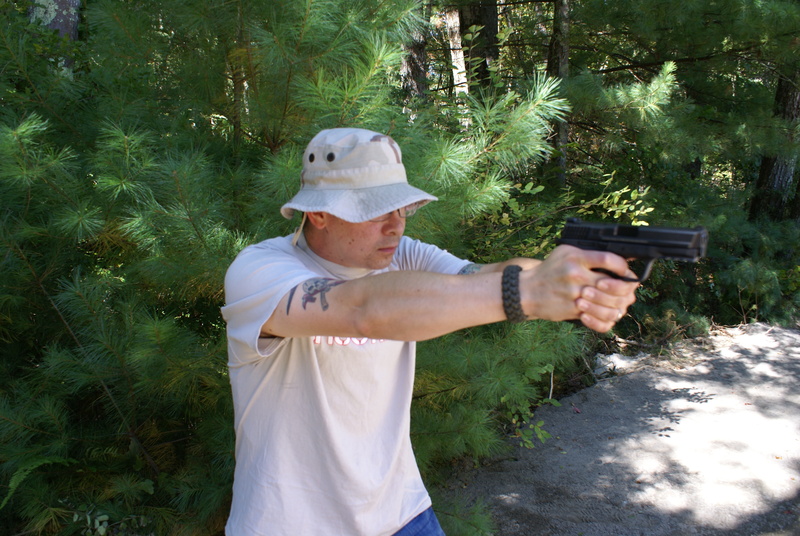 Dropping the rounds in from being loose in your hand is faster than loading the speed loaders by hand. 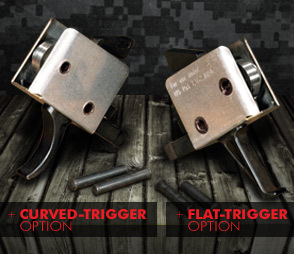 The speed loaders easily slip over the blocked rounds, allowing for fast pick up or organized unloading. With a capacity for eight reloads, you’re good-to-go. The bedside block is a perfect addition for those who use a revolver for home defense. What I like about it is; it holds two cylinders worth of ammunition. 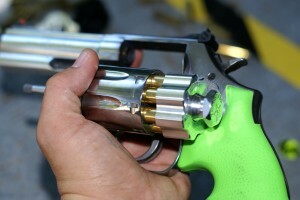 With speed loaders on top of both, you can quickly load an empty sidearm and have a full reload immediately available. Please remember basic safety; never store ammunition or firearms where children or unauthorized persons may access it. The tested speed loaders were in a fine machined and black anodized finish, and ran flawlessly during testing. The listed price is $24.95 each. You can see a couple of dings on the anodized finish, but there is no bare aluminum showing. The rounds that are in the speed loader line up well with the cylinder, and no resistance was felt while inserting the rounds in. 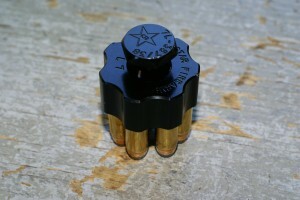 The rounds deploy cleanly, and drop right in. Even at a flatter angle. 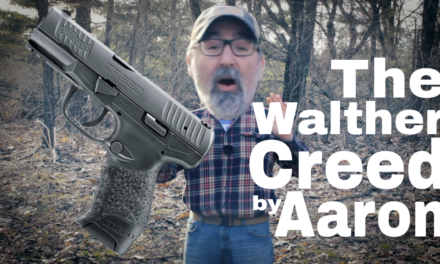 I was pleasantly surprised by these products from 5 Star Firearms. The overall quality and reliability of the tested loaders and blocks is outstanding. Even with minimal practice, my reloads are consistently faster versus other speed loaders. Due to the nature of how these products work, it’s a little difficult to describe exactly what happened during testing. My recommendation; get them. Don’t waste your hard-earned money on other speed loaders. 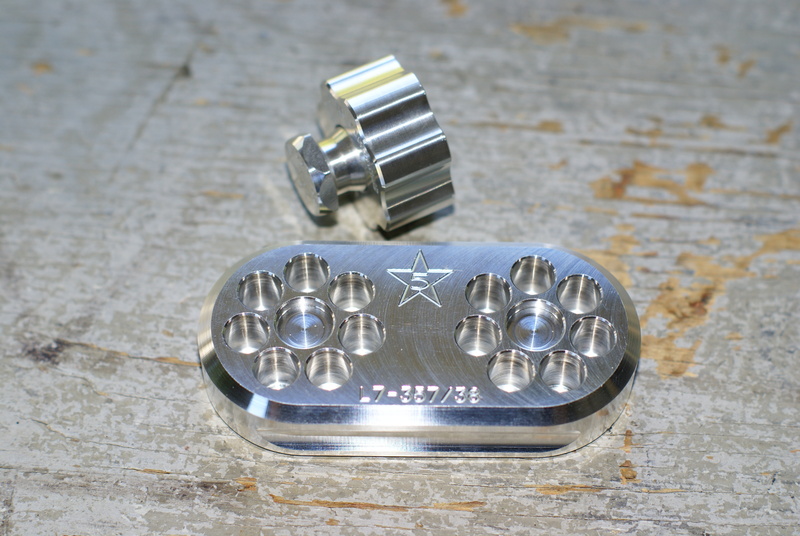 Invest it in the high quality products from 5 Star Firearms. 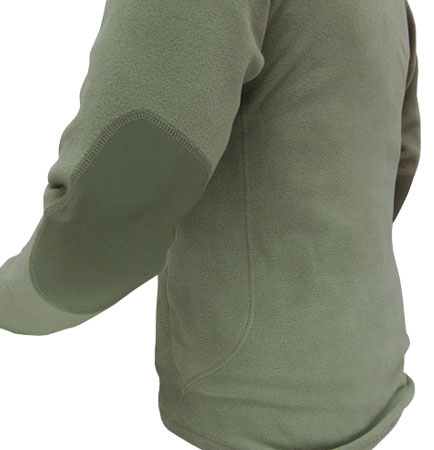 With a variety of items available, chances are you’ll find exactly what you’re looking for. I will be purchasing more soon, as well as purchasing exclusively from this company in the future. 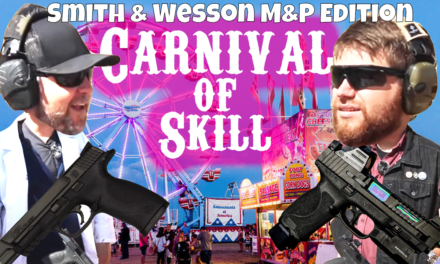 PreviousWLS 006 – Watch out for military assault spoons! 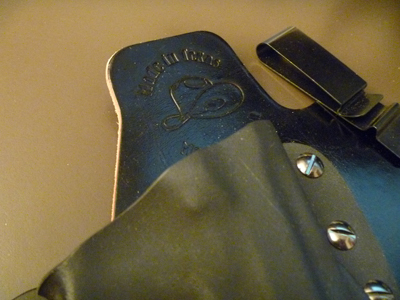 NextWLS 007 – From now on, Girls get .45’s!